The Honda CR-Z is a sporty, two-door hybrid hatchback, which is a unique niche for a vehicle. Going on sale as a 2010 model, the CR-Z received an updated front and rear for 2016. There are new wheels, a restyled bumper and liftgate spoiler, and revised side skirts. The interior also gets a refresh. Aluminum accents can be seen prominently on the dashboard, centre console and even on the doors. Finally, the hatch hybrid receives more standard features and options like a premium Honda Display Audio system. Why is the 2016 Honda CR-Z Proving to be so Popular Among Car Buyers? The 2016 Honda CR-Z is sold in one well-equipped model called the Premium. Power comes from a 1.5-litre four-cylinder engine from the automaker's famed i-VTEC line. This gas engine is mated to an electric motor linked to a lithium-ion battery. The entire setup generated 130 horsepower and 140 lb.-ft. of torque. That's when paired to the standard six-speed manual transmission. Torque drops to 127 when the CR-Z is equipped with the optional continuously variable transmission (CVT). Fuel economy varies. CR-Zs equipped with the manual consume fuel at 7.9 L/100km in city driving, 6.5 L/100km when cruising along the highway and 7.3 L/100km combined. Those with the CVT get slightly better figures at 7.0 L/100km city, 6.4 L/100km highway and 6.8 L/100km. "Despite that economy car-like MSRP, the CR-Z's cockpit oozes sport performance," notes the car site, Driving, after some time behind the wheel. "The aforementioned driver-oriented cockpit emphasizes the two-seat nature, with the minimal switchgear all easy to reach and operate, large easy to read gauges, a sport-steering wheel loaded up with essential controls and sport seats that provide comfort when sitting in L.A.'s infamous freeway gridlock yet firm bolstering when carving up the empty canyon roads. The bright red piping in contrast to the black seating also added to the sport charm of the interior." Note the above fuel economy is based on the Government of Canada's 5-cycle testing method. Actual fuel consumption will vary based on driving habits and other factors. The information was provided in this review for comparison purposes only. As expected, the Premium is rich with features. This is especially true in safety. The CR-Z is built using Honda's Next-Generation Advanced Compatibility Engineering body structure. Also called ACE, this framework helps channel any impact away from the passengers in the event of an accident. Dual-stage front airbags, front-side airbags and side-curtain airbags further minimize injuries. Finally, drivers have better control and confidence thanks to such active safety technologies as a four-wheel anti-lock braking system, hill-start assist, vehicle stability assist with traction control and electronic brake-force distribution. See our 2016 Honda CR-Z Inventory! 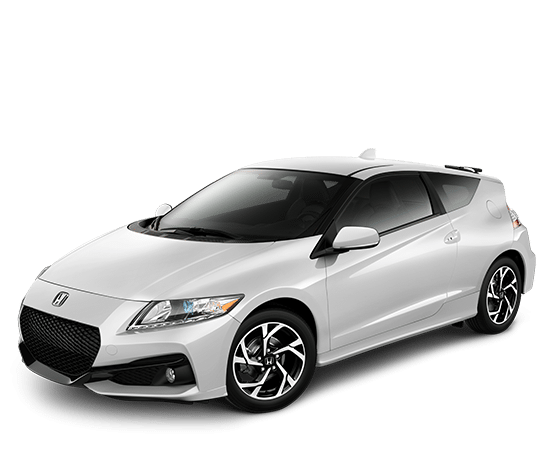 Contact Us to Test Drive a Honda CR-Z Today!